TOGHS has become an official Ghost Adventures Crew member! Our group is listed on the Ghost Adventures offical members page. 2 Responses to TOGHS has become an official Ghost Adventures Crew member! 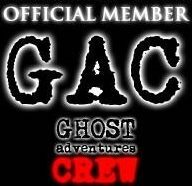 Our group is listed on the Ghost Adventures offical members page. Ghost adventures is so awesome , you guys really show the Gusto . I personally think ghost hunting is a differ t mission each time Sb7 & Sb11 is turned on . Hope to get autograph picture of GAC , Take Care ; Christian Panzarino .